I really do hate my tendency to make excuses (and I really would rather be done with the chair than dragging it out any longer than needed), but this has been a week of just about everything going wrong that possibly can, so I think this time it’s warranted (all the other times, less so). My Maya license expired on me in spite of me taking the exact actions suggested by their built-in authenticator. My tablet seems to think it’s a funny game to just sort of go narcoleptic if I let my stylus get more than, like half a foot from it, and my computer has been running extremely loud just about all week in spite of a thorough cleaning. So, if I don’t make my self-imposed Wednesday posting deadline, or if I make it in a less spectacular fashion than I’d hoped, that’s what’s up. And, for no apparent reason, UDK refuses to launch tonight, and I really don’t have much time to troubleshoot it right now on account of needing to be at work early and all day tomorrow. So, I guess the bake and my WIP textures aren’t getting thrown into this update. Not much point making a separate post when all I’ve got, then, is the one screenshot from Mudbox then. Well, this isn’t where I planned to be 4 days later, but, computer and website freakouts last night, sudden plans tonight, and a disinterest in sculpting on my birthday (so I UV-ed instead? Well, Happy Birthday to me…) left me here so far. Eh, new habits take time, and Wednesday is still theoretically, a better day for the week’s absolute posting deadline habit to fall given my current schedule. Sculpt, not even close to finished. Will edit with more details later. Okay, so, unexpected plans unexpectedly aborted, but not before losing 4 hours of my night, and now that I’m back, computer is chugging and making scary noises again. I did manage, however, to get a little bit further along in the sculpt, though, not without smoothing it down and restarting another two or three times (which, along with going back and changing the base mesh at least once) is a big part of why there hasn’t apparently been a whole lot accomplished here yet. I’m steadily getting closer to getting those dimples in approximately the right spots, though hitting that sweet spot between “noticeable valleys between the dimples” and “accurately subtle valleys between the dimples” is still giving me a Hell of a time. Just a short update tonight, for a number of reasons. My computer is running noisily enough that I’m concerned for its safety if I keep making it hang out in Maya with subdivided-thrice models from Mudbox. I’m thinking posting on Saturday isn’t all that great with my current work schedule, coming as it does after my two longest days of the week at my day job. It’s a good recipe for procrastination, so I’m going to try to make Wednesday my posting deadline (though I’ll need some White-out for my calendar…) and hopefully force myself to better use all the time I’ve got available in the early part of the week. 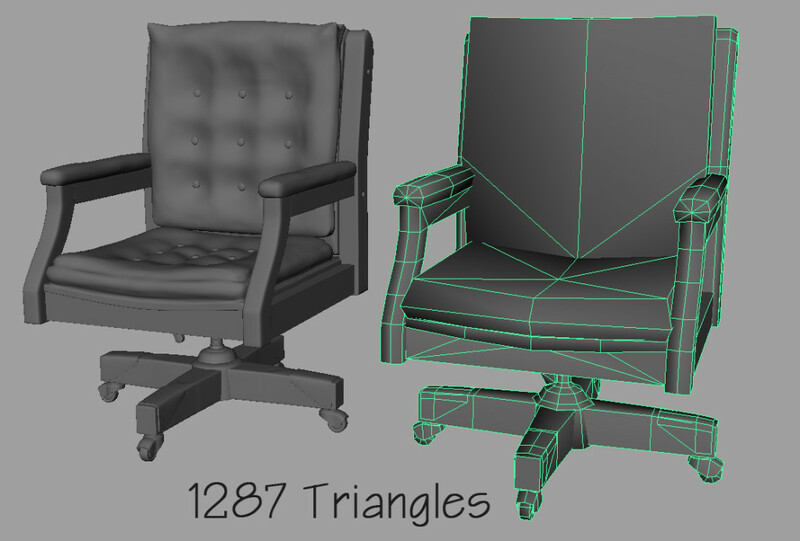 Alright, so, knocked it down to 1,166 Tris so far, beating Round 1 by over 100 Tris. 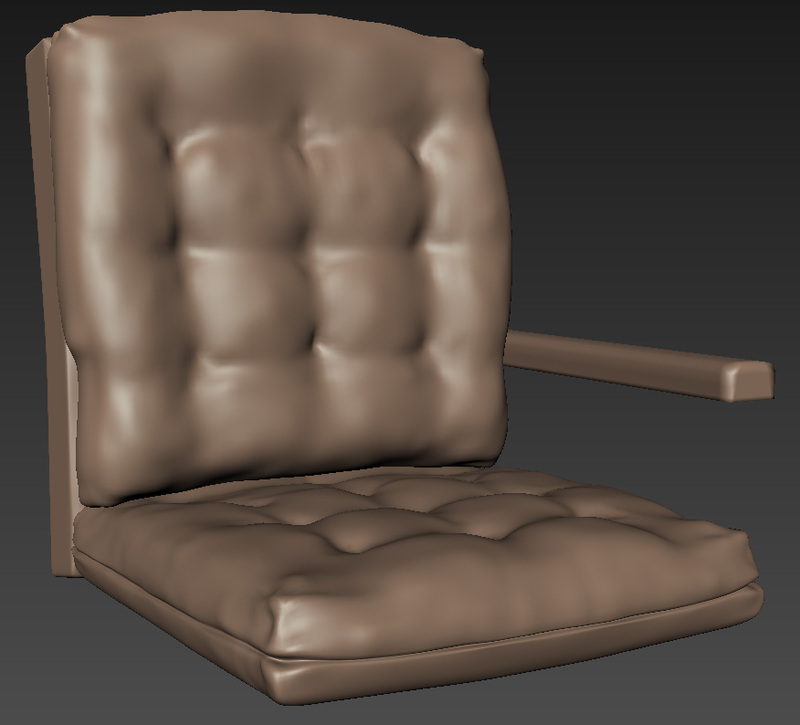 I don’t expect there will be any drastic changes to the silhouette when I update the sculpt, so I feel pretty confident the Low-poly cushions aren’t going to change, and the frame isn’t getting touched again anytime soon. 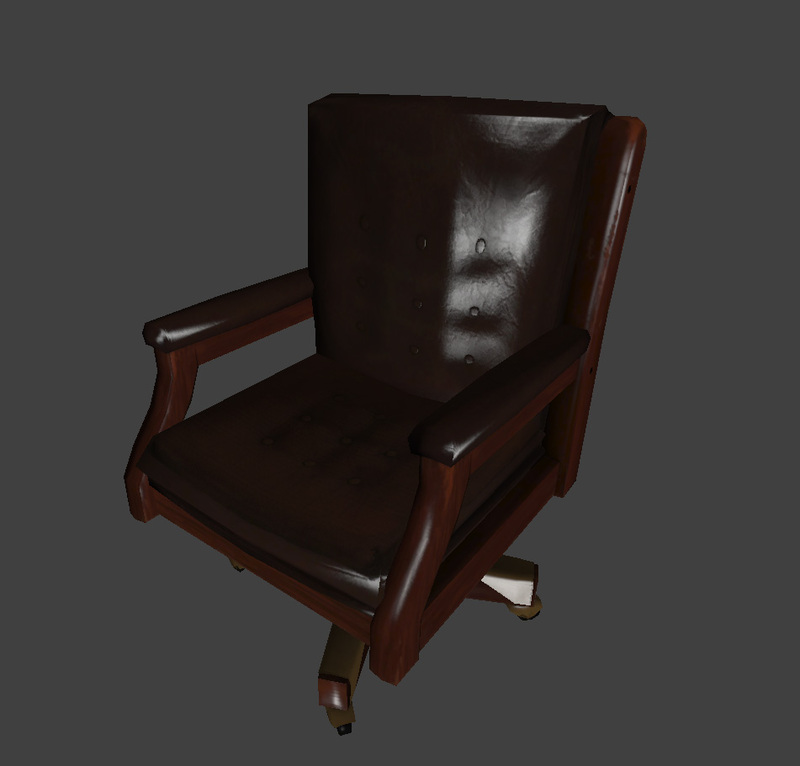 Alright, as promised, only a day behind schedule, we’re back to work on the chair and this time, I’m gonna get it, if not right, then not so glaringly wrong as before. Now I’m as into the swing of things as I’ve ever been, the tricks that I figured out with Mudbox and Spec Power maps are fresh in my mind, and now I can go about shooting for accuracy rather than wrestling with the software. So, here we are. Remodeled the base pretty much from scratch. I kept the casters and the seat frame since all they needed were some tweaks to their proportions and positions from the original version but were otherwise pretty accurate. Sculpting is where things kinda got fun. 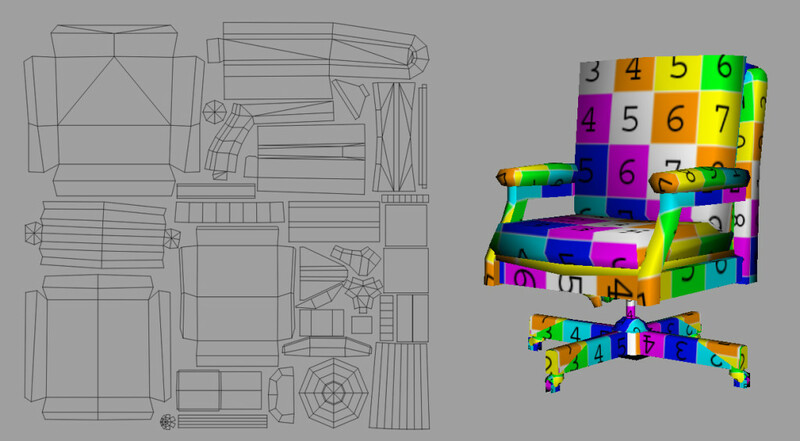 I mayhaps shouldn’t have just started over from the base mesh I sculpted on before, if for no other reason than that I forgot until I brought it back into Maya that they were exported at a time when the frame was in a very different position, and stuff just plain doesn’t line up (most notably the indent in the backrest cushion caused by the armrests wound up too high, and the seat and backrest don’t quite line up right in Maya either). However, I’ve definitely managed at least a 100% fluffiness increase over the previous version of the sculpt. Probably going to require a bit of bouncing around between Maya and Mudbox next session to get everything lined up properly. Has to be delayed, on account of this throbbing pain behind my eyes that’s been bugging me all day and kept me from my plans to steal away every chance I got in between visiting with family from out of town to try and finish up my new and improved sculpt of the chair. 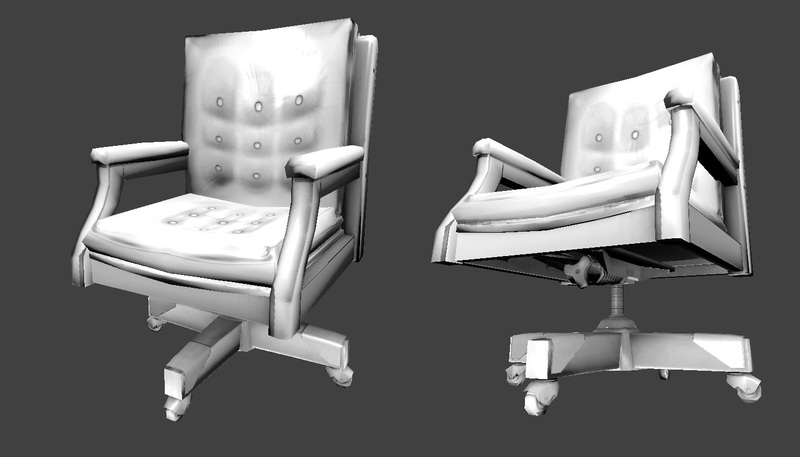 I was considering screengrabbing where I’m at and suffering through making a post with a bunch of caveats about what’s left, but I figure, instead, I’ll just finish up tomorrow (mystery headaches permitting) and make my weekly update just a day late, covering the whole redo, through High-Poly and sculpting. Nailed it. And by it, I mean the technical difficulties I was having with my spec power, that I didn’t make a big enough deal about for anyone to know about because they fell in the middle of the week when I didn’t really have anything to show except technical difficulties. 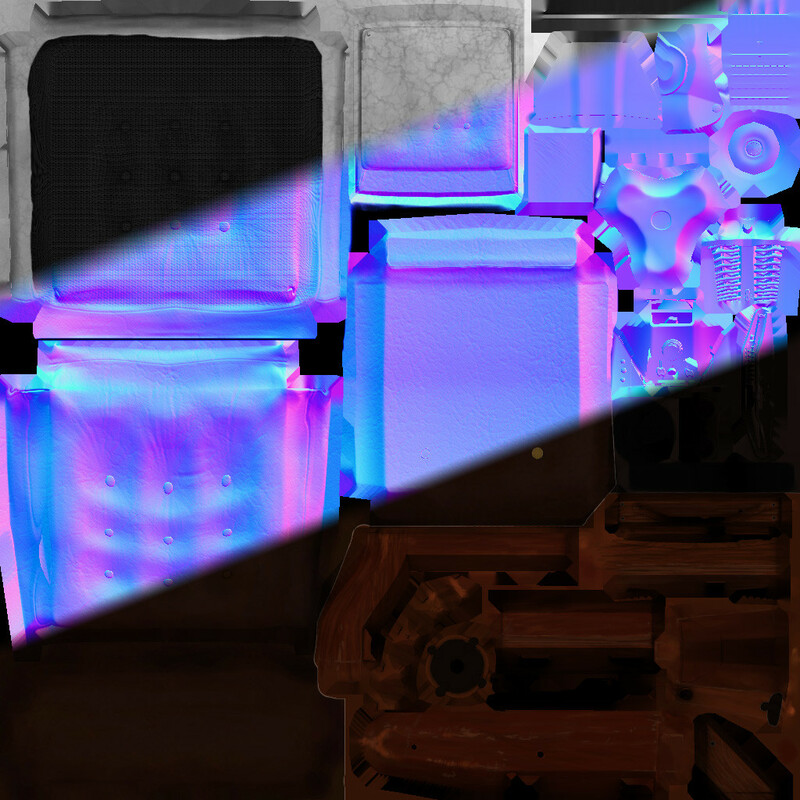 Apparently, UDK wants a Specular Power value far in excess of 1, and, when I plugged in just the grayscale map, I was giving it values somewhere between 0 and 1. I couldn’t figure out why I was generating these jagged highlights that just basically looked like they were using the Spec map for diffuse (and I kinda wish I had screengrabbed them, just because it was a cool effect, even if it was tear-your-hair-out frustrating when I couldn’t figure it out). After enough looking at UDK’s own materials (not immediately helpful because I didn’t see a single Spec Power map) and trying to track down explanations of how Spec Power worked, I eventually noticed the trend that all the ones I was seeing were somewhere between 10 and 100. So, once I figured out that I needed to think of my grays as numerical values (0.2, 0.8 etc. ), and suddenly the Multiply node made perfect sense! I wasn’t looking at a pure white map. I was looking at a bunch of splotches of 10-times-whiter-than-white, 40-times-whiter-than-white, and so on (shut up. This is a big realization for me). And then I had myself some metal getting tight highlights, just like I wanted, some polished wood getting almost-as-tight highlights, and some cloth and leather getting much softer highlights. Ehh… much as I’d like to be, probably not. Of course, it would happen while I’m high on the sensation of finally getting it right and hitting up my blog for the first time in a week, ready to post the “I’m done. Moving on to something more fun,” post, I see a critical comment making the dreaded “You should probably start over” suggestion. And this one has the gall to be straight, to the point, and not feel like the author is going out of his or her way to insult me, my education, and all those other anonymous things that Anonymous said so anonymously whenever the Hell that was (Last year? Longer? Blog time is so far removed from real time the way I’ve used this blog over the years). And yeah, my sculpt didn’t exactly turn out great. I was so psyched to just have Mudbox doing what I wanted it to that I settled for not making sure I was using that awesome power to attempt to create an accurate simulacrum of what I was looking at. I spent so much time frakking around trying to just get my Spec and Spec power to behave that I’m sure I let the textures suffer in other areas, and I know there’s some proportions that are all wrong (the feet are too wide, for one) that have been bugging me ever since I erroneously called the model “done”. I think I may have to actually take the advice this time. I mean, I did say I was going to stick around until I got it right (wait… I only thought I said that? I could’ve said “to Hell with this” any time, but didn’t? Ah crap, well, I’m saying it now. 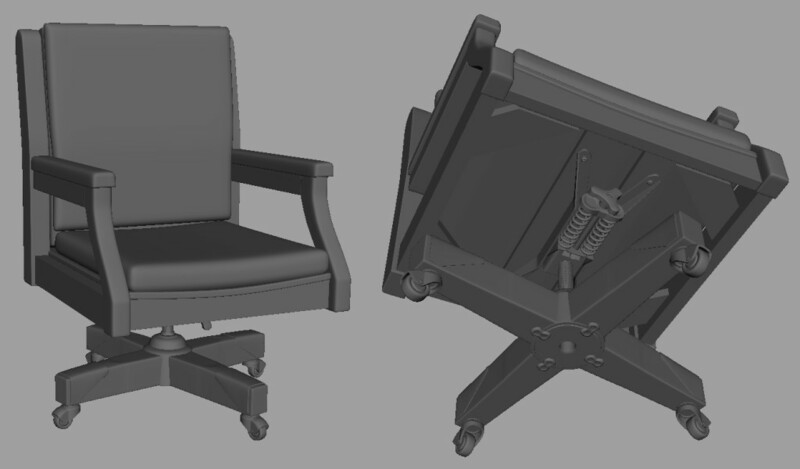 No sense rushing it and being able to proudly declare I spent more than a month modeling a simple prop, but not doing it very well), and I don’t know what “fun thing” I was going to do after this, so I might as well say that this time, I’ll bite the bullet, go back to square 1-ish, and make a better product this time around, closer to my reference, and with a Hell of a lot less procrastination and a little bit more knowing-what-the-Hell-I’m-doing. Maybe I’ll even go completely mad and say that I’ll put some time into lighting that actually shows off the asset and putting it in a room that kinda makes sense instead of just a mishmash of Unreal materials. Was not looking forward to this. 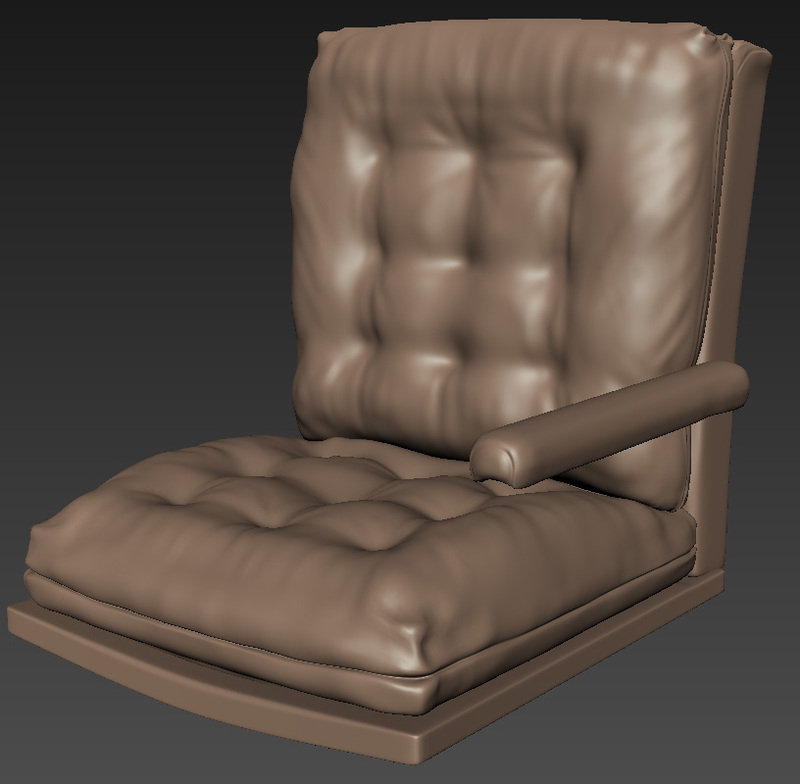 Had a busy week, but even without the legitimate excuses to not be texturing, I’m sure I wouldn’t have gotten much farther than this because I haven’t found that wonderful, magical point where texturing stops being a chore that I know I’m going to have to keep suffering through and starts being a fun time when the thing I’m making actually starts looking like the thing I’m referencing. Until I manage to get out of this valley of texturing inability and disgust, I know I’m going to keep finding all the games I can play highlighting things on my desktop more appealing than just getting to work. 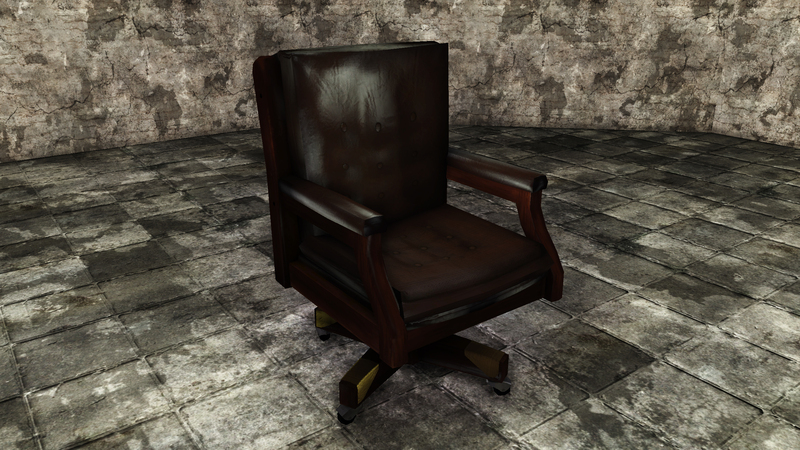 Okay, so the Static Mesh Editor remains a terrible venue for screenshotting your assets. Glad to see that hasn’t changed since the last time I was at this point on a project. Sometime when my calendar isn’t derisively asking me if I’ve written my week’s blog post yet, and my feet aren’t killing me from standing at my desk most of the day, I’ll probably cobble together a quick room so I can have some tiny modicum of control over camera and light placement. 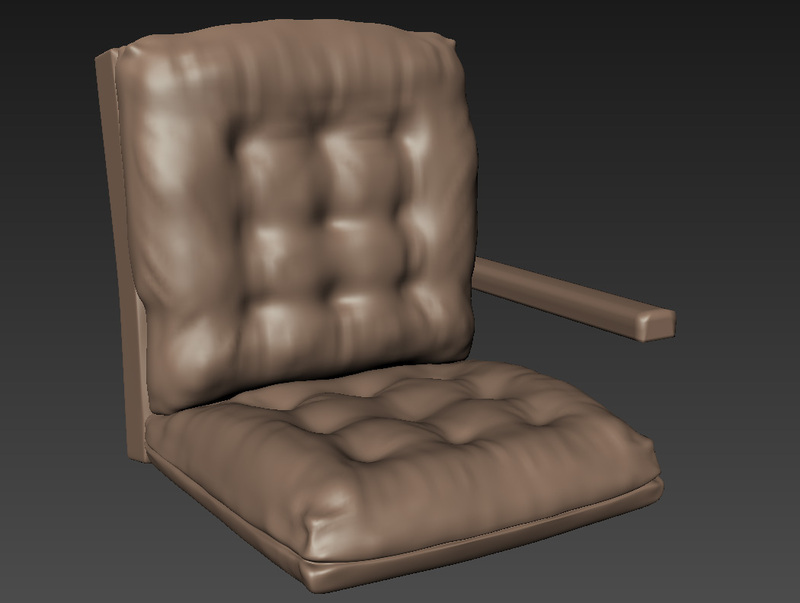 I’m actually pretty happy with most of the actual chair portion. There’s some detail work I haven’t gotten to, some flecks of spilled paint, the stitches I couldn’t manage in Mudbox, and this handprint on the back that I don’t know where it came from, but the leather looks pretty close to leather, and I finally managed to push the wood, leather, and cloth, to look like they’re not the exact same value of brown. We’re coming along here! Just don’t look at the base. I’ve barely touched any of the painted metal parts yet (or the unpainted ones), and spec and spec power are still things that I haven’t figured out how to implement visibly the majority of the time, much less getting them to do what I actually want. A long hunt for tutorials followed by implementation is still on the to-do list. Did not get low-poly finished as soon as I’d hoped, but it’s here now. And then I UV-ed and quickly baked to test them. Things seem to be on track so far. Hopefully we can avoid the usual issues of things going pear-shaped when I start texturing for real after a weekend off with family. Incidentally, I can’t help feeling like I ought to take a stab at defending my decision to take such a glacial pace with this prop. On the one hand, I know before I’ll be willing to call myself a “professional” artist (and, if I had to guess about a pace that’ll be necessary before anyone will give me the paychecks that indicate they think I’m a professional…), going-on-3-weeks for a prop like this will not be acceptable. On the other hand, I think there’s something to be said for, when your confidence is as shaken as mine was before I started off on the chair, easing yourself back into it. I lost count of how many times I got disheartened trying to hold myself to some sort of short deadline without having the underlying skills necessary to actually make something that looks good. A week for a prop or a month for an environment sounds like a great plan, but I don’t think I’m quite there yet, and I have a long list of unfinished projects to prove it. Given a week for what should be a simple sculpt, that friends of mine might knock out in a couple hours, and I happen upon one of the first times I’ve felt like Mudbox wasn’t working against me and that I’m *gasp* getting a hang of this. If the same holds true with making these textures work finally, I think I’ll be ready to turn up the speed and difficulty a setting or two soon. We’ll see, hopefully I’ll be able to get a low-poly finished up by the end of the night, and maybe some UV’s and preliminary bakes before too long. I’ll probably just jam it into this post if I get it done soon enough. I know I just said that the plan was to not just keep getting frustrated attempting to make realistic props, but coming up on a week after I made that post (certainly a week after I started writing that post…) my brain just hadn’t flipped back over into big idea mode enough for anything else. 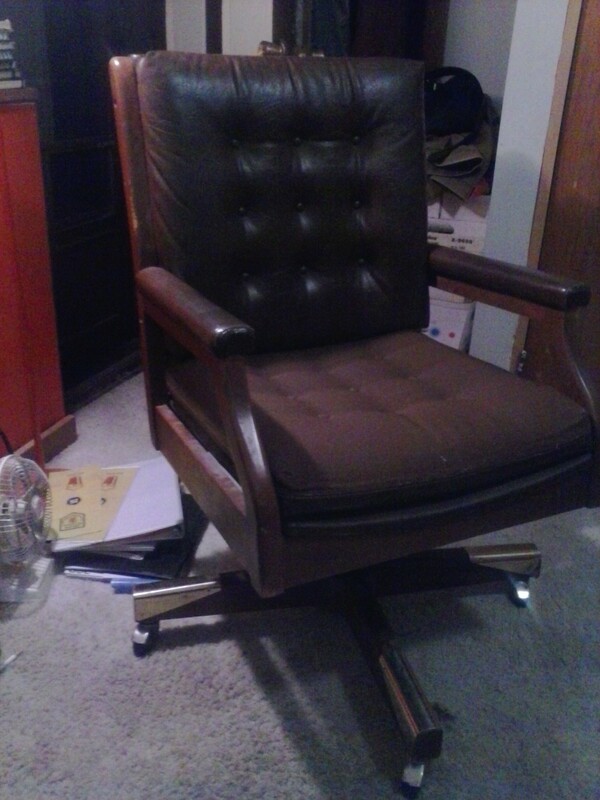 The chair was here; I wasn’t using it since I had converted to a milk crate-based standing desk, and, not that any camera I own is going to show it, it’s taken a beating and has got some nice big spots of textural detail on it. So, after approximately 6-ish hours back on the horse, the Maya portion of Hi-poly is mostly done. Will probably tinker on that for way longer than I need to before I bite the bullet and start sculpting.